Hanunoo mangyan poem written in the Baybayin syllabic writing system. A part of our Filipino heritage worth looking at and looking after. Beautiful poem! Our heritage is truly interesting, yung writing dun parang part of a design na rin. Is this the poem writen on the knife? hi sidney, cruise, jeff & ferdz! 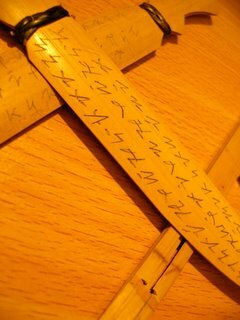 yes, indeed, the english translation is that of the poem written in baybayin on the knife. the script in itself, looks like part of the art. it's certinaly interesting to read more of the over 2,000 poems they have in store for us to discover. God bless y' all!